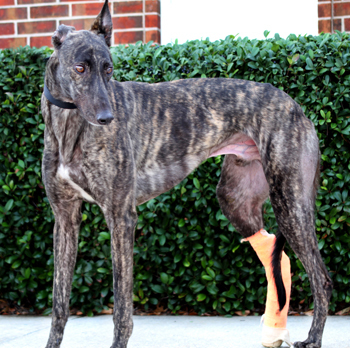 Lee, aka Genesis Way, is a handsome 2½-year-old dark brindle male born on August 8, 2008. His sire is Swahili Eile, and his dam is Simone. 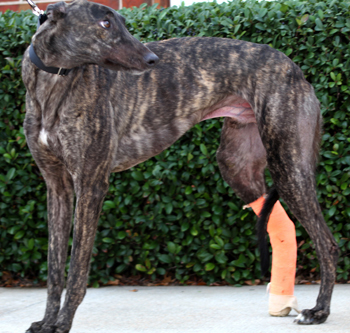 Lee has five races to his credit on Greyhound-data.com, starting November 3, 2010 at Gulf Greyhound Park in LaMarque, TX, and ending December 1, 2010, with a fractured left hock. Lee was transported to GALT on December 8, was evaluated by Dr. Bob Radasch of the Veterinary Surgical Center, and surgery was performed on December 10. Lee's surgery was more complicated than first expected. A 3.5mm 70mm long lag screw was placed down the shaft of the calcaneous into the fourth tarsal bone. A wire was then placed in "X" fashion for stability. After 6 weeks of bandage changes every 10 days, an x-ray shows the leg to be healed. Dr. Radasch is pleased with the outcome, and says the screw may have to be removed at sometime in the future if irritation occurs. Lee is not cat tolerant.